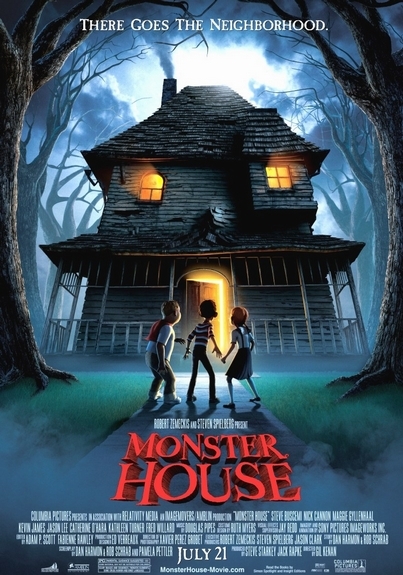 Story: In Columbia Pictures' comedy thrill-ride Monster House, three kids (voiced by newcomers Mitchel Musso, Sam Lerner and Spencer Locke) cross over to the other side of the street to unlock a mystery and experience the greatest adventure of their lives. Twelve-year-old DJ Walters, who is caught in that awkward moment between childhood and the onset of puberty, has too much time on his hands and has taken it into his head that there's something weird about old man Nebbercracker's house across the street. Things keep disappearing into the dilapidated structure: basketballs, tricycles, toys and pets. Come to think of it, whatever happened to Mrs. Nebbercracker? It's the day before Halloween and DJ and his candy-friendly pal Chowder have a run-in with Mr. Nebbercracker after their basketball wanders onto his lawn and is mysteriously swept into the house. When the house tries to swallow their new friend Jenny and no one believes the frightened trio's claims that the house is up to no good, it's up to them to investigate. They turn for advice to the only person on the planet who might even remotely understand what's going on, the wise one they call Skull, a 20-something slacker pizza chef and master of the arcade machine who once played a video game for four days straight on one single quarter, a gallon of chocolate milk and an adult diaper. "I have heard tell of man-made structures becoming possessed by a human soul," Skull tells them. You mean the house is alive? Yikes! Skull tells them the only way to stop the house from gulping down everything in sight is by striking at its heart, which the kids figure out must be the perpetually-fueled furnace in the basement. They come up with what seems to be a foolproof plan -- a vacuum cleaner disguised as a human dummy filled with cold medicine. The kids offer up their bait to the house, figuring that once it's asleep, they can sneak in and put out the furnace with their squirt guns. Their little plan goes awry, though, and when the house starts chasing them down the street -- that's right, chasing them down the street! -- they must join forces to once again make the neighborhood safe for trick or treaters.